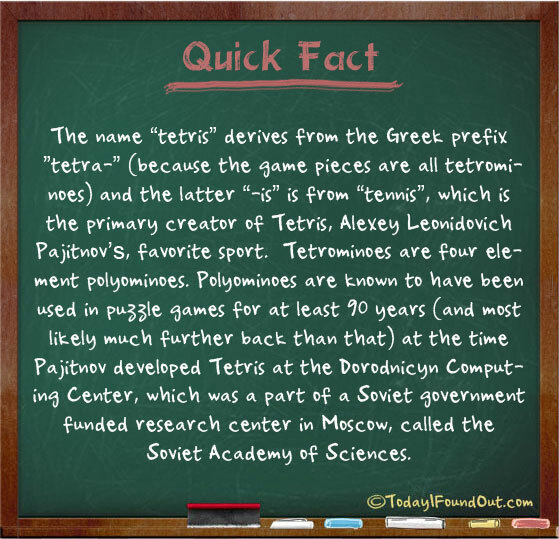 The name “tetris” derives from the Greek prefix “tetra-” (because the game pieces are all tetrominoes) and the latter “-is” is from “tennis”, which is the primary creator of Tetris’, Alexey Leonidovich Pajitnov, favorite sport. Tetrominoes are four element polyominoes. Polyominoes are known to have been used in puzzle games for at least 90 years (and most likely much further back than that) at the time Pajitnov developed Tetris at the Dorodnicyn Computing Center, which was a part of a Soviet government funded research center in Moscow, called the Soviet Academy of Sciences.